Shiftless Mommie: Who's Afraid of Vera Wang? Who's Afraid of Vera Wang? My dear friend is getting married this week. I am in the wedding, so I have been spending an inordinate amount of time with the happy couple. The problem is that they aren't happy. They hate each other. The level of contempt in their discourse astounds me. Nothing is ever easy with them. Going out to dinner becomes a toxic mess of sarcasm and embarrassing revelations. I understand this is a stressful time, but I'm extremely uncomfortable during these battles. Drop them. Drop them like bad habits. They are not only toxic, they are infectious. They didn't start out this way. Someone infected them. Some writhing, spewing beast with two backs both facing each other. Do you think the heart-shapes are too tacky? I don't like the idea of using square vases because the corners seem too masculine. For the love of God, woman, nobody is going to care about your stupid centerpieces. The only thing tacky about this wedding is the cash bar. I swear to God, shut up. I'm not asking my parents to pay so that your cheap family can get trashed and throw up all over themselves. We have been over this but clearly you haven't been listening. (Rotating the fabric to avoid marking it with his sweating hands) Guys, we don't have to decide this now. If none of the vases seem right, we can go someplace else. There's no need to argue about it. You're right, Nick. I'm so happy you are here. I really need someone who is rational. You know exactly what it means. If it weren't for Nick, I would be doing all of this by myself. It's like I should be marrying him. Oh, is THAT what's going on! I'll kill you, Nick. Look what you did! He's bleeding all over the aisle runners. I never liked that material anyway. You think I'm kidding? Enjoy the weeks of physical therapy followed by the slow, painful process of rebuilding your psyche. Contempt is insidious because once it starts, it can't be stopped. All of human interaction depends on our ability to suppress our nature anger at the stupid behavior of the people we love. Once we acknowledge that our partner's failings are annoying, rather than endearing, we might as well sign on for a reality show and drive our dying relationship jalopy to hell. I don't know if their relationship is doomed, but they will probably need a heavy dose of counseling with somebody good. To quote the indomitable Helen Buckman, "Well, you know, honey, the odds aren't good." In the meantime, you need to distance yourself if you want to salvage the original friendship or whichever friendship you like more. How do you distance yourself when you signed on to be their wedding slave? By becoming exceedingly busy. Make sure you are available for the major events: showers, bachelor/-ette parties, actual wedding. Other than that, you are officially booked for any events that involve both of them. Which brings me to my final, tangential point: What has possessed couples that they now believe all wedding activities must be a team event? Equality is not redundancy. Tandem wedding planning is usually just one party demanding an audience. This practice must end. Divide the child in half. Maybe if couples didn't spend every waking moment together, it would take them longer to hate each other. Since I'm judging this week's challenge grid, I can't compete (because of ethics and stuff), so I'm bringing back my fun persona for the hangout grid. Head over to both grids and check out the great blogs! Excellent post. All true. All completely true. Plus you should expand that script - I think that Oliver Stone would be interested and I think that if you include a helicopter crashing into the building then Michael Bay would be on board too. "Love & Death at A.C. Moore." I've been watching way too much "Bridezilla." Don't sweat the small stuff - cliche? Yes. But seriously what every relationship needs to believe in to survive. Not just relationships...life in general. Particularly when it is this hot. I've had to take a deep breath and refocus twice today before lunch. This was a great read. Very fun! Fun persona once you return to the challenge grid, please. Remember, we all have our mental health to consider. Plus, aren't we better humans when a touch of humor is involved? p.s. I don't think I like your engaged couple friends, but I live inside a laptop, so what do I know? Never fear, I'm back. It was nice to stretch this summer, but I can't take myself too seriously for too long. I become insufferable. There are days when the grass looks pretty green inside that laptop. I've never been in a wedding other than for my sister - and then it was just sisters as a wedding party. 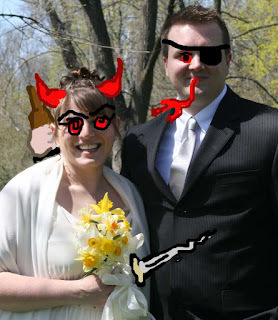 And I have to tell you, I wish I could add the fun embellishments to photos that you do. So freaking funny! That's hundreds of dollars of community college tuition at work and enough Photoshop-power to recreate the Sistine Chapel. I like to think I put it to good use. Oh the play was hysterical! Great scene. I know some folks who are like that and I just don't know why they bother to stay together. You are dead on! I didn't even think of that! In another compartment of my life I (gasp) perform weddings. The amount of hysteria over the three or four hour event is nauseating. I loved the rage of this piece. I read it while listening to Eminem's "Lose Yourself." Perfect soundtrack. Perhaps all brides should be pregnant. Then if they still freaked out over the masculine lines of the vases, they could blame hormones. "we were meant to distribute the sludge among multiple partners over a period of time" should be embroidered on a throw pillow. I am not a throw pillow person. I don't own functionless upholstery, but I'd buy one of those.